Jacob Hamacher’s stock continues to rise. The 19-year-old winger had a breakout season last year in the North American Hockey League (NAHL) with Wilkes-Barre/Scranton, and that success has translated to the Corona native making the jump this season to one of the premier franchises in the United States Hockey League (USHL), the Dubuque Fighting Saints. “I think Jacob is a really gifted mind and is really creative in the way he plays,” said Dubuque coach-GM Jason Lammers. “We were looking for a player like that – someone who can make plays and has good vision. He has really good hockey sense, and he does a good job of knowing where and when to move the puck. The Fighting Saints – who have advanced to the USHL final three times in the past six seasons – had their eyes on Hamacher last season while he was in the midst of putting up 40 points in 46 games in Wilkes-Barre/Scranton and accepting an invitation to the NAHL Top Prospects Tournament. Dubuque then selected Hamacher in the fifth round of Phase II of the USHL Draft. Prior to Dubuque, Hamacher spent two seasons in the NAHL, debuting as a 17-year-old in Wenatchee. After landing briefly with the Minnesota Wilderness to start last season, Hamacher was traded to Wilkes-Barre/Scranton, where he emerged as the team’s leading scorer. In his youth days, Hamacher skated for the California Titans, LA Hockey Club and Wildcats Hockey Club. “Playing in the NAHL was a great experience for me and it taught me a lot,” said Hamacher. “The jump from 16U to the NAHL was huge, but jumping from the NAHL to the USHL is huge as well. I thought the pace in the NAHL was fast, but in the USHL it’s even faster. I need to play my game to be successful here, and that means using my vision and my hockey sense. 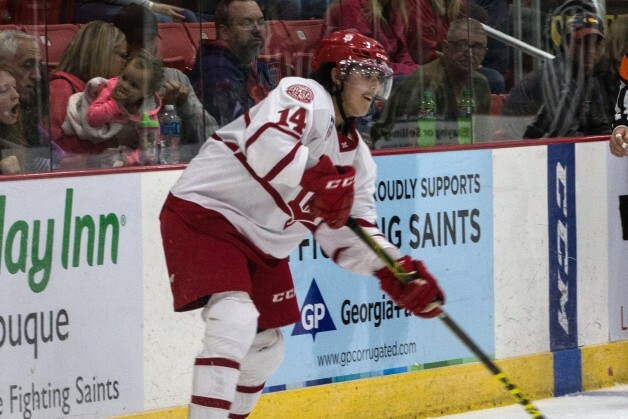 Stepping into an organization that has championship aspirations is a challenge Hamacher welcomes, and he says he was quickly impressed with what Dubuque had to offer, and has high hopes for the Fighting Saints. Meanwhile, the early part of the season brought Hamacher something else he had been yearning for – a Division I scholarship – as he committed to the Rochester Institute of Technology (Atlantic Hockey) in early October. “I’m a very driven person,” said Hamacher. “In the past, I’ve been cut from teams and passed over, and all that does is make me want it that much more. I control what I can control and for me right now, that means playing my game, putting up points and being an impact player, being a good teammate.